Local police say 'misunderstanding' led officers to beat Jewish victim after he had been attacked by Arab man. An Israeli Jewish man who called police after being attacked by an Arab in Germany was knocked to the ground and beaten by officers responding to his call for help. The incident occurred on Wednesday in a park in the German city of Bonn. The victim, a 50-year-old Israeli Jewish professor, was wearing a kippah when he was attacked by an Arab-German man. 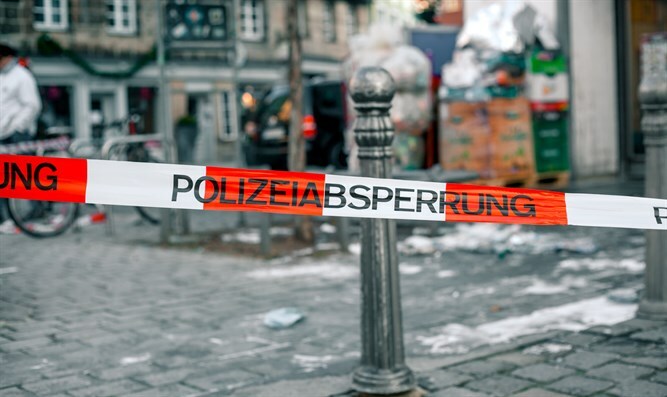 According to The Local, the 20-year-old Arab assailant confronted the victim, shouting “No Jews in Germany!” and shoving him. The attacker also knocked the professor’s kippah off. When the professor called for help, a companion notified police. But when officers arrived, they proceeded to neutralize the victim, shouting at him to surrender. Officers then knocked the professor to the ground, handcuffed him, and punched him in the face. Police later realized that they had arrested the victim, rather than the perpetrator, and tracked down the assailant, who was subsequently taken into custody and transferred to a physiatrist clinic. The North Rhine-Westphalia interior minister, Herbert Reul, spoke with the professor on the phone Thursday to offer his own apology, Westdeutsche Allgemeine Zeitung reported. “We will not permit Jews to be persecuted in such a fashion ever again in Germany,” Reul said. In April, a group of Syrian migrants living in Berlin assaulted an Israeli Arab man who had been wearing a kippah, whipping him with a belt and cursing him.